It's finally the big night of Julia's wine tasting event. She greets her guests and introduces the evening's itinerary. In her hand is a simple clipboard with paper and a pen. It's an "organic" look befitting a wine tasting event, Dan King says. And it's a prime opportunity to collect details about her customers' likes and dislikes, he adds. Julia invited businesses that complement her own to participate in the wine tasting. It's a win-win situation for everyone involved: Julia receives free donations from her partner businesses, and the partner businesses get free advertising. Hear Julia welcome her guests and introduce her partner businesses. "Give customers a reason to visit," King says. "That's what advertising is all about." Offer customers a coupon only good for 15 to 30 days, like the example to the right, so they have a reason to return within a certain period of time. Promote a training class that will be hosted at the store in the next month. 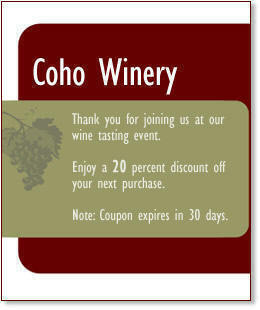 Invite customers and their friends to future special events.